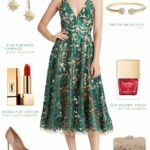 You are here: Home / Bridal Shower Dresses and Bridal Shower Attire Ideas / What Should You Wear to A Bridal Shower as a Guest? What Should You Wear to A Bridal Shower as a Guest? Today, we’ll answer the question: What should you wear to a bridal shower as a guest? 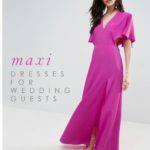 If you are invited to a wedding shower this spring or summer, you might be wondering what to wear to a bridal shower. We’ll take a look at a few guest of a bridal shower outfit ideas for you! Just as I do with wedding invitations, I look to the bridal shower invitation for clues about formality. The location, season, time of day, weather forecast, and how formally — or casually– dressed others are likely to be are all things that I usually consider. Bridal showers, like weddings, can range significantly in style. Some bridal showers are an informal afternoon potluck or cookout at someone’s house. Other events might be may be beautifully decorated brunch at a venue, a catered lunch at a hotel, or a party-like celebration at a wedding venue, or restaurant. There are also Jack-and-Jill showers, which involve both spouses-to-be and their friends. This type of shower is often held as a casual party in the late afternoon or evening. If the invitation doesn’t specify a dress code — or doesn’t give much context for how formal the event may be — you’ll usually be ok with a dress or a skirt. Perhaps you have friends who are attending the same shower. If so, you can all confer about what to wear a little. If you don’t know the couple or their friend group very well, then you can usually ask the hostess for a little advice about the dress code if you are still stumped. Based on my own experience with bridal showers, I’ve added some guidelines below. In general for women, a nice skirt and a top, sundress, jumpsuit, or dressy top with pants and heels will suit nearly any shower setting. If you are browsing your own closet, I recommend wearing something you’d wear to church, a holiday gathering, or to a nice dinner out with your friends. That daytime dress or festive outfit that you always get a compliment on? Wear that! If you have a cute spring dress you’ve been wanting to wear, or you need an excuse shop for a new top, this may be the time! If you are the one hosting the shower, or in the wedding in some capacity, you may want to dress up a little more than you would as just a guest. It doesn’t have to be anything over-the-top, just something to show your pride in hosting or attending! These are based on the the general bridal shower dress codes from showers I’ve attended. If there’s a bridal shower dress code that doesn’t fall into these categories and has you stumped, follow us on Instagram and write a comment below a post! What it will be like: An outdoor cookout or very informal gathering at someone’s house. Casual Attire Suggestions: A sundress, pretty top and skirt, festive top and pants, or even a jumpsuit or cute romper might all be appropriate. If you know others are wearing casual spring or summer clothes then maybe even a pair of dressy shorts might work. Wear dressy shoes and accessories to add a little celebratory nod to this look. 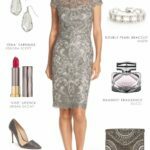 A more formal gathering at someone’s house or venue, but it will be festive and dressy. Perhaps there is even a theme. Attire Suggestions: I’d stick with tailored daytime dress a pretty floral maxi dress, or a combination of cute tops with skirt or pants, and pretty heels or sandals. What it will be like: Maybe a high-tea, or dressy event at a restaurant, or hotel. 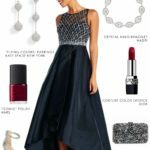 Formal Attire Suggestion: Again, a skirt and top – slightly more formal material this time – or a beautiful semi-formal daytime dress like a floral lace sheath dress or printed midi dress, or floral maxi dress would be what I’d select. Dressy jewelry and heeled sandals or pumps would finish off the look! White. Just like a wedding, please try not to wear a white dress, or other all-white ensemble, as this may be what the bride-to-be has chosen to wear. And, obviously, if you know the bride-to-be is wearing another color instead, also try not to exactly match that color. Jeans. I would also stay away from jeans, although in some more casual cases – like a cookout or open house shower – white jeans and a dressy top might be an exception. You know your friends and the crowd best! I have even been to super-casual showers where the bride and guests are wearing dark wash jeans. If that’s what the honoree and crowd is wearing, then that’s fine! Jeans are just something I would avoid entirely I were at all unsure of the formality. Skimpy Stuff. Don’t wear anything too revealing. Bridal showers are parties, but not the place for your new body-con party dress. Keep in mind the shower will likely have guests of all ages, and the couple’s close family members. It’s not the time for a skin-tight dress or a low cut tops. Keep the look classy and lovely! Super-Formal Dresses. Also avoid being too dressy! I know, I know, there are a lot of contradictions! Just don’t wear an embellished cocktail dress that would be more appropriate for evening. After all, it would be slightly embarrassing to be more dressed up than the shower honoree. Just like a wedding, it’s great to choose something elegant and understated and classic. You can’t go wrong with a beautiful color, or pretty print. Uncomfortable Shoes or Outfits. Showers can also involve a lot of eating, drinking, and game playing. You may be helping with food, or cleaning up after presents. Be comfortable! All Black. This isn’t a hard and fast attire no-no, but usually showers are festive daytime events, so an all black outfit is a little somber. If you are wearing black for some reason, break it up with pretty accessories. Or, wear a bright color top or skirt, to balance our a black top or black pants or skirt you may be wearing. Nordstrom. The day dress or casual dress section always has some great ideas! Red Dress Boutique. So many cute ladylike dresses and rompers at affordable prices. Lilly Pulitzer. Perfect dresses for a preppy bridal shower or a beachy or coastal bridal shower. Classic styles in the most fun colors – which is ideal to wear for bridal shower festivities! ll sizes. The also have the cutest maternity dresses if anyone in your crew is expecting! LOFT. 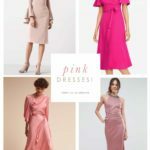 If dresses aren’t your style (or even if they are!) or you want a pretty top or skirt to wear instead, I always love this spot. Boden. Also lots of brightly colored casual dresses and dressy tops! Dillard’s This southern-US-based department store has sweet, pretty floral dresses and dressy tops galore! ModCloth. Always super-sweet dresses, with a slightly retro style, with a great range of sizes from petite to plus. Rent the Runway. 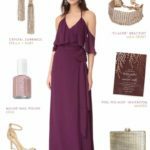 If you have a ton of showers and special events to attend, you may want to check out Rent the Runway and their Unlimited program.. you can get a stream of outfits for several different events, including lots of pretty shower outfit picks! J.Crew Factory. There’s usually a good sale to be had on these already affordable sundresses! Don’t forget to add some pretty jewelry! BaubleBar and Kendra Scott have beautiful pieces. If you need favors or decor for the bridal shower, Beau-Coup and Target and of course Amazon and Etsy have some fantastic ideas. If you need to send out invites, try the selection at Minted! I hope this helped you learn What Should You Wear to A Bridal Shower as a Guest? Also check out the inspiration we created for a formal Kate Spade Bridal Shower Party. You may also find a dress you love in our dressy casual dress picks! 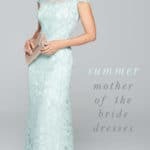 Also check out our choices for bridal shower dresses for the bride! 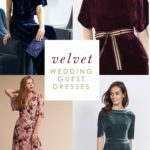 And if you’re trying to figure out what to wear to a wedding, we have so many wedding guest dresses to choose from here too!